Although UJE music is mostly instrumental but they succeed to share these stories during various media interviews and articles are issued and the community get informed and inspired. UJE has an album called Ezintabeni, which was recorded at Music House KZN in association with KwaZulu-Natal Department of Arts and Culture, as well as Ethekwini Municipality Department of Arts and Living Cultures. That entails for the album being distributed to all Ethekwini Municipality Libraries and created a recognition for the ensemble to be featured in big music festivals, such as Durban Jazz Festival, Ugu Jazz Festival, Umlazi Jazz Festival and some of corporate events. 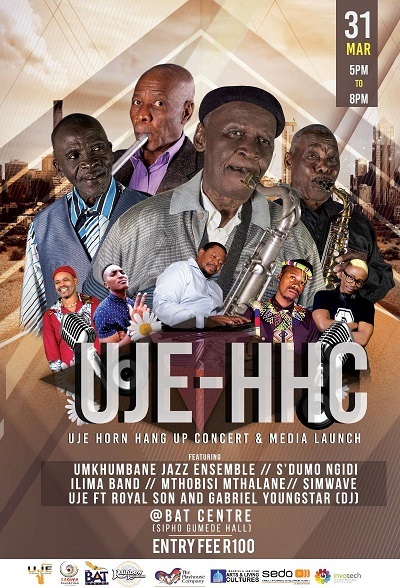 Two of eleven members of the ensemble - Mr Moses Sefatsa, 85 years old Tenorr Saxophonist and Adolph Kunene, 85 years old vocalist - have decided to hang up their gloves in the music industry because of age and unstable health conditions. UJE asked Atlas Duma of Sagiya Foundation to invite relevant stakeholders to put together a farewell concert to honour these old musos. The concert will be presented as a fundraising concert that will donate some revenue as a gift to these legends as a token of appreciation to their families for a sacrifice they made up to this far. Sagiya Foundation, Invotech Business Incubator and UJE received positive response from three of the major arts institutions and decided to present a 3-Legged Farewell Concert for the UJE Music Legends. Nise Malange from BAT Centre, Neil Comfort from Rainbow Restaurant and Jazz Centre and Linda Bukhosini from The Playhouse Company and Ethekwini Municipality have committed to play vita role to honour these musos by hosting 3-Legged Farewell Concert called UJE Horn Hang up Concert (UJE-HHC). This project will also recognize and honour both 77 years old Jerry Kunene and Sdumo Ngidi for their lifetime commitment it the music industry. The concert will take place on Sunday March 31, 2019, from 17h00 to 20h00 at the Sipho Gumede Hall in the BAT Centre. Tickets R100 at the door.